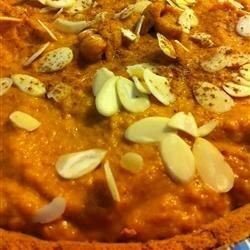 "This wonderful new twist to the traditional pumpkin pie has vanilla ice cream in the bottom and is lined with a gingersnap crust! Cool and refreshing! Garnish each slice with a dollop of whipped topping and some crushed gingersnaps if you like." this was wonderful, a treat for kids and grownups alike! We had it for Thanksgiving in Jamaica and it was perfect! Just remember to use a DEEP DISH pie plate, as it really fills it up! This pie is amazing! It was a perfect dessert for a fall party, with traditional ingredients and a fun spin! Don't hesitate to make this!